After an absence of almost two years, Axel Rudi and his band were back in Weert to promote their new album 'Knights Call'. It was the third show of the first part of the 2018 tour. It was alsoy the only concert that will be given in the Netherlands. Despite that, there were many German visitors and even eight fans from Greece. It was of course a special day in the Netherlands, memorial day and so before the concert started with the support act Crystal Ball the music was turned off and with all those present 2 minutes of silence the past was remembered with great respect. In itself a special experience if you know that a few minutes later the decibels would erupt. The support act was the Swiss band Crystal Ball who managed to warm up the venue. With a relatively long set they managed to captivate the audience with sing-alongs. 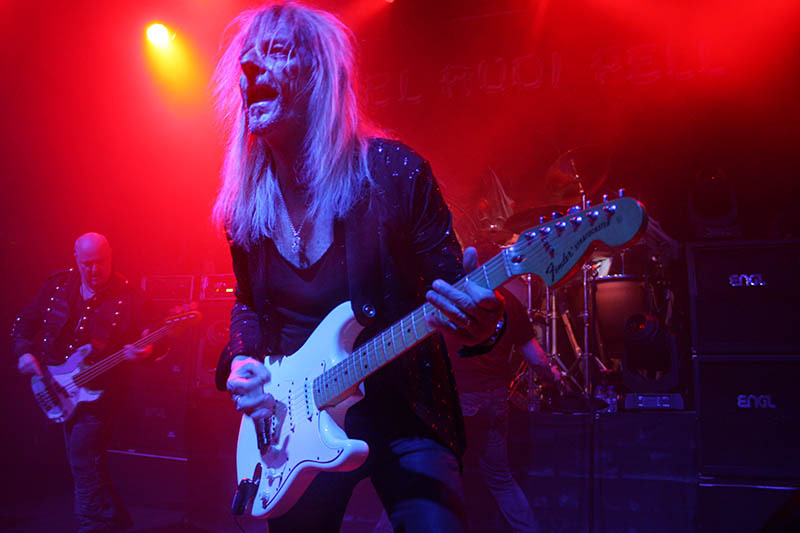 Eventually, Axel Rudi Pell's intro could be started just over nine o'clock and as expected the show opened spectacularly with 'The Wild and the Young' followed by 'Wildest Dreams'. The mood was fine from the start. As we are used to, Johnny raged over the small stage and immediately got the attention of the audience. Then followed 'Fool Fool'. The band looked fresh and everyone was in a good mood. Volker really showed pleasure and made a lot of contact with the public. 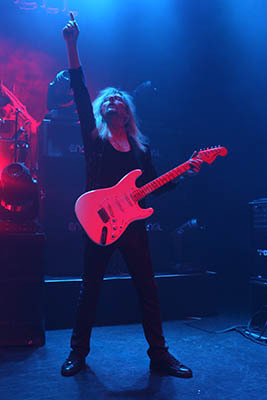 Axel Rudi also regularly walked from one side of the stage to the other so all his fans could enjoy his many solos. Especially the songs from the last album have a lot of short solos that live did very well. That Johnny is a good singer we already knew and also that he can sing the ballads in particular, one of his favorites is 'Oceans of Time'. He always sings this with passion, after which he can easily switch to the energetic 'Only the Strong will Survive'. 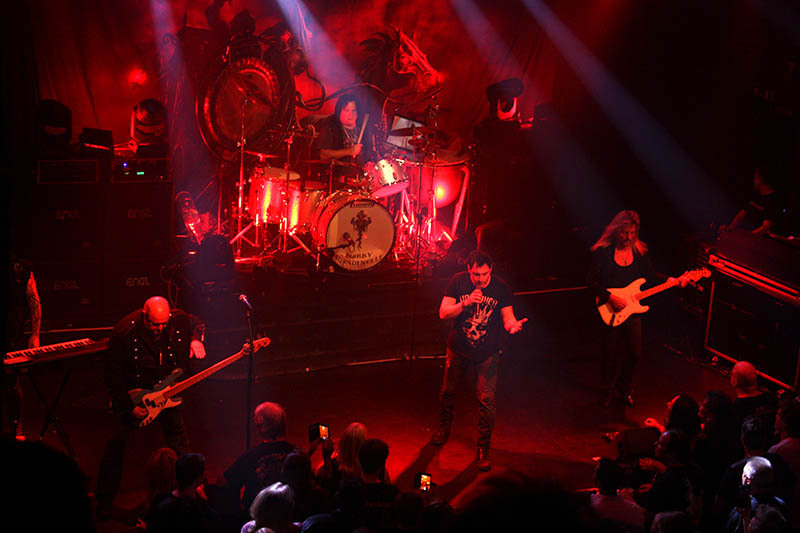 Many songs from their new album were played, including "Long Live Rock", reminiscent of Rainbow's "Long Live Rock 'n Roll". Axel Rudi clearly shows who inspired him. For us as Rainbow fans that is not a punishment. Barely recovered from our trip to Berlin to see Ritchie at work, this concert is not a rejuvenating feeling but rather a 'Zugabe' on Rainbow. Especially with Bobby behind the drum kit, which gives me a better feeling than the drummer in Berlin. 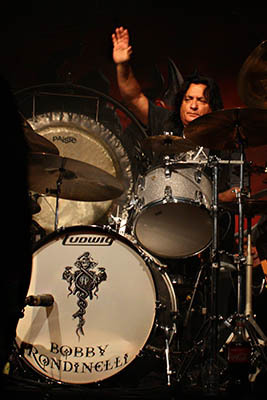 I think Bobby is a great drummer who showed in his drum solo during 'Mystica' that you can also drum with your hands. The big gong was also removed from the storage. He did that with Rainbow at the time (June 13, 1981 in Rotterdam). The only difference was that his drumsticks did not pop into the venue this time. That was then special in Rotterdam. When I spoke to him later on after the concert he was surprised that we still knew that. He said 'we are getting old'. After 'Long Live Rock', Ferdy was allowed to show his skills on the keyboards after which 'Game of Sins' was used with a transition to a shortened version of the 'Tower of Babylon', the masterpiece of the lastest album, and was concluded by 'Game of Sins'. Then came the worldly ballad 'The Line'. It remains a song to get goose bumps and it was not surprising that some fans became emotional. I must confess that this number also has a special meaning for me. The final of the show came with 'Edge of the World' and 'Truth & Lies'. And still the Duracel batteries were not empty for Johnny. He continued to whip up the venue and worked towards the highlight of the evening. After putting all band members in the spotlight, the show was ended. But as it should be, the band came back for a sensational ending with encores 'Masquerade Ball', 'Casbah' and 'Rock the Nation' after which the band got a great applause. Afterwards we talked briefly with Axel Rudi and Bobby about the tour and picked up some old memories, including the evening with Rainbow in Ahoy in 1981. They remain nice persons who like to meet their fans. A little later we also did a photo shoot with Johnny and then drove home with a satisfied feeling.